This year’s offerings include everything from the rise of the electronic dance scene to the bane of contaminated drinking water; the Barbecue Tongs Murderer of San Gabriel; the X Games; adoptive families; overcoming sexual abuse and homophobia; Internet dating; and the millennial propensity for do-it-yourself projects. For those who have ever wondered why GCC has so many steps, there is a simple answer: geology. Review of the latest in progressive metal music. Misogyny and video games. 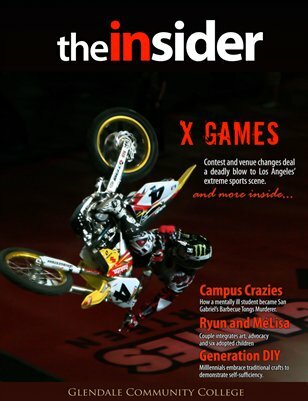 In short, there’s something for everyone in Glendale College’s student magazine.